If you’ve ever taken an old yearbook off a dusty bookshelf and laughed about the styles of the time, OldBooth from GetApp may be for you. With either OldBooth Premium or the free OldBooth Lite, you can take a photo of someone and transform them into a sailor from the 1920s or a mullet-sporting relic from the ’80s. A New Old-School Look: The premium version of OldBooth features more than 20 base styles for men and women that you can apply to photos stored on your iPhone or iPod touch or ones that you take from within the app. OldBooth works by using a new photo you’ve shot with the iPhone’s camera or an existing one from your library, and merging just the face with the rest of the image. You can have your face on someone with a 1970s afro or show your girlfriend with a big 1980s perm. When you launch OldBooth, you first choose whether you are creating an image of a male or female. 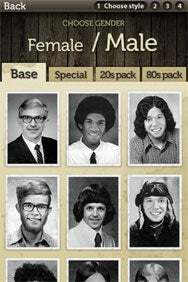 The app offers a selection of yearbook-style head shots to choose from. The $2 Premium app OldBooth Premium features more than 20 base styles for men and women, as well as additional themed packs available through in-app purchases. The free version works exactly the same way, except it’s ad-supported, and there are only four choices to work with for each gender. Once you’ve selected a look, you can choose a photo from your camera roll or take one with the iPhone’s camera from within the app, which gives you the option of showing a slightly transparent version of the mask over the camera screen. This can make it easier to take a photo that’s the right size, and it’s an extra bit of fun. A recent update to OldBooth Premium allows access to the iPhone 4’s flash and front camera while the mask is on. When you have a photo you’re happy with, you can use multitouch gestures to pinch and expand the image so that it fits properly within the face area of the themed image. A brightness/contrast slider allows you to match the skin tone in the photo to the other image surrounding it. All images are black and white, which serves two purposes—it fits the theme of older photos, and it makes it much easier to blend the skin colors. After you’ve finished editing, you can save the image to the camera roll or share it on Facebook or Twitter. OldBooth is a very nicely designed app that’s easy to use, and leads to some good laughs. The Lite version is great for a quick spin through the app’s capabilities, but once you see all the additional looks to choose from in the Premium version, you may be quick to upgrade.